^ Nathaniel, Ras (2004). 50th Anniversary of His Imperial Majesty Haile Selassie I. Trafford Publishing. ISBN 1412037026. p. 30. ^ "Haile Selassie of Ethiopia Dies at 83". New York Times. August 28, 1975. ^ Lefebvre, Jeffrey Alan. Arms for the Horn: U.S. Security Policy in Ethiopia and Somalia, 1953-1991. Pitt series in policy and institutional studies. Pittsburgh, Pa: University of Pittsburgh Press, 1991. p.
^ Patrick E. Bryan, The Haitian revolution and its effects. ^ “African leaders unveil statue of Ethiopia's last emperor”. ABCニュース. (2019-02-10). https://abcnews.go.com/International/wireStory/african-leaders-unveil-statue-ethiopias-emperor-60971046 2019年4月9日閲覧。. 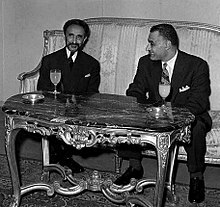 ^ Haile Selassie in Jamaica: Color Photos From a Rastafari Milestone（英語） |Time.com, Ben Cosgrove, Jul 10, 2014.